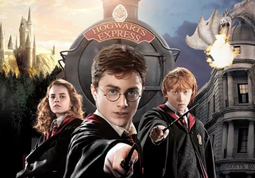 Within Universal's Islands of Adventure™ theme park you can visit Hogwarts™ castle and explore Hogsmeade™ village. And at Universal Studios Florida™ theme park, you can enter Diagon Alley™ to enjoy a mind-blowing thrill ride, magical experiences and more. Early Park Admission2 to The Wizarding World of Harry Potter™ and Universal's Volcano Bay™ one hour before the park opens (valid theme park admission required). ***Promotional Vacation Package rates are per person, per night, tax inclusive and based on two (2) adults and two (2) children (ages 17 and under) on a 5-night length of stay at a Universal Orlando Resort Hotel in a standard room with a 3-Park 2-Day Park-to-Park Ticket with 2 Days Free per person, Breakfast at Leaky Cauldron™ - one (1) per person, Breakfast at Three Broomsticks™ - one (1) per person, and one (1) Shutterbutton's™ Photography Studio session - one (1) per package. Tickets are valid for admission to Universal Studios Florida™, Universal’s Islands of Adventure™ AND Universal’s Volcano Bay™ on the same day. Ticket is valid for any four (4) calendar days during a seven (7) consecutive calendar day period which includes the first day any portion of the ticket is used. Promotional discount rate is based on savings from Value 1 Length of Stay rates at a Universal Orlando Resort Hotel; Universal’s Endless Summer Resort - Surfside Inn and Suites (Opening August 1, 2019). Rates and discounts vary by hotel, length of stay, room type, travel dates, season and are subject to availability. Rates are valid for bookings now – 12/11/19 and for stays most nights Sunday–Thursday; 8/25/19 - 9/26/19, 12/1/19 - 12/19/19. Rates are higher on Friday, Saturday and holiday nights. 4 Night Minimum Required. Reservations must be made 24 hours in advance. The number of rooms available at these rates are limited. Additional rates and travel dates are available. **Promotional Vacation Package rates are per person, per night, tax inclusive and based on two (2) adults and two (2) children (ages 17 and under) on a 5-night length of stay at a Universal Orlando Resort Hotel in a standard room with a 3-Park 2-Day Park-to-Park Ticket with 2 Days Free per person, Breakfast at Leaky Cauldron™ - one (1) per person, Breakfast at Three Broomsticks™ - one (1) per person, and one (1) Shutterbutton's™ Photography Studio session - one (1) per package. Tickets are valid for admission to Universal Studios Florida™, Universal’s Islands of Adventure™ AND Universal’s Volcano Bay™ on the same day. Ticket is valid for any four (4) calendar days during a seven (7) consecutive calendar day period which includes the first day any portion of the ticket is used. Promotional discount rate is based on savings from Value 1 Length of Stay rates at a Universal Orlando Resort Hotel; Universal’s Cabana Bay Beach Resort, Universal’s Aventura Hotel, Loews Sapphire Falls Resort, Loews Royal Pacific Resort, Hard Rock Hotel®, and Loews Portofino Bay Hotel. Rates and discounts vary by hotel, length of stay, room type, travel dates, season and are subject to availability. Rates are valid for bookings now – 12/11/19 and for stays most nights Sunday–Thursday; 11/25/18-12/20/18, 1/6/19 - 1/17/19, 1/21/19 - 2/14/19, 8/25/19 - 9/26/19, 12/1/19 - 12/19/19. Rates are higher on Friday, Saturday and holiday nights. 4 Night Minimum Required. Reservations must be made 24 hours in advance. The number of rooms available at these rates are limited. Additional rates and travel dates are available. *Promotional Vacation Package rates are per person, per night, tax inclusive and based on two (2) adults and two (2) children (ages 17 and under) on a 5-night length of stay at a Universal Partner Hotel in a standard room with a 3-Park 2-Day Park-to-Park Ticket with 2 Days Free per person, Breakfast at Leaky Cauldron™ - one (1) per person, Breakfast at Three Broomsticks™ - one (1) per person, and one (1) Shutterbutton's™ Photography Studio session - one (1) per package. Tickets are valid for admission to Universal Studios Florida™, Universal’s Islands of Adventure™ AND Universal’s Volcano Bay™ on the same day. Ticket is valid for any four (4) calendar days during a seven (7) consecutive calendar day period which includes the first day any portion of the ticket is used. Promotional rate is based on Rosen Inn International. Rates and discounts vary by hotel, length of stay, room type, travel dates, season and are subject to availability. Rate valid for bookings now – 12/11/19 and travel 11/1/18 - 12/22/18, 1/1/19 - 2/10/19, 4/26/19 - 6/15/19, 8/26/19 - 9/30/19, 11/1/19 - 12/22/19. 4 Night Minimum Required. Reservation must be made 72 hours in advance. The number of rooms available at these rates are limited. Additional rates and travel dates are available.